Upgrade and renew your factory rear seats to look like new with SOR's Deluxe Vinyl Rear Jump Seat Covers. These restoration quality seat covers are sewn to factory patterns using OEM dimensions. Made of high quality marine grade Naugahyde vinyl to match your factory interior. Sewn with durable nylon thread, top stitched with matching finished welted seams. SOR's Deluxe Vinyl Rear Jump Seat Covers are made to fit like a glove, tailored to fit your year and model. Manufactured by Specter so you know they fit! Available for all years, and models, even Non-USA Land Cruisers. Comes with detailed installation instructions. Available in Light Charcoal Gray Marine vinyl. Fits 1958-1961 FJ25 rear bench seat - Made of Coral marine grade vinyl. 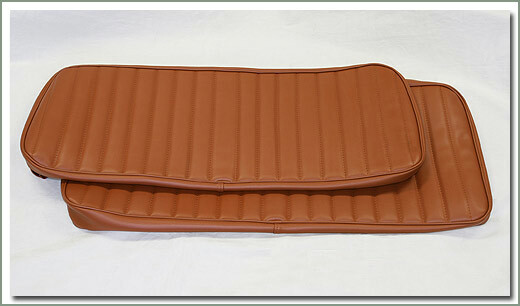 2 piece upholstery set includes back bench seat and bottom bench seat cover. Fits 1958-1961 FJ25 rear bench seat- Made of light charcoal grey marine grade vinyl. 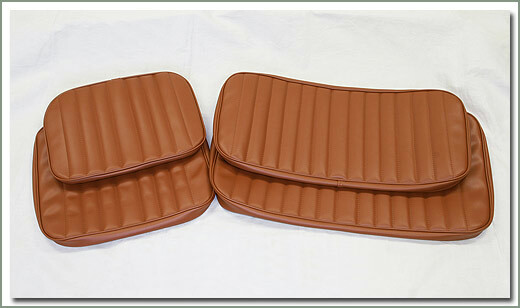 2 piece upholstery set includes back bench seat and bottom bench seat cover. 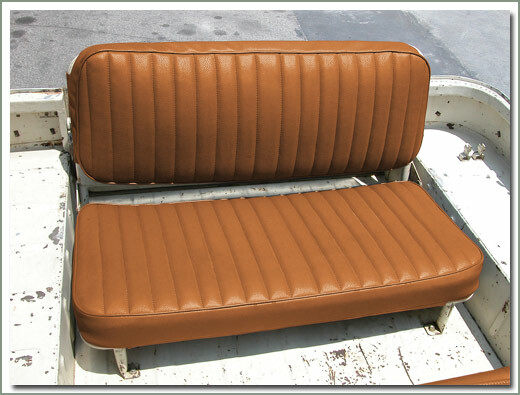 Upgrade and renew your factory seats to look like new with SOR Deluxe Vinyl Seat Covers. These restoration quality seat covers are sewn to factory patterns using OEM dimensions. Made of high quality Marine Grade Naugahyde vinyl to match your factory interior. Sewn with durable nylon thread, top stitched with matching finished welted seams. SOR Deluxe Vinyl Seat Covers are made to fit like a glove, tailored to fit your year and model. Manufactured by Specter so you know they fit! Available for all years, and models, even Non-USA Land Cruisers. Comes with detailed installation instructions. Available in Light Charcoal Gray Marine vinyl. Fits 1958-1961 FJ25 front split bench seats- Made with Coral Marine grade vinyl. 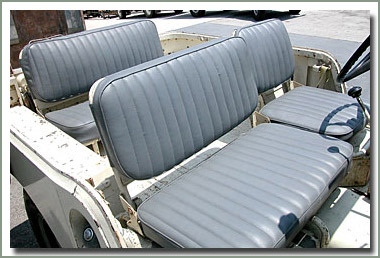 4 piece upholstery set includes drivers back and bottom cover and passenger bench back cover and bottom bench cover. 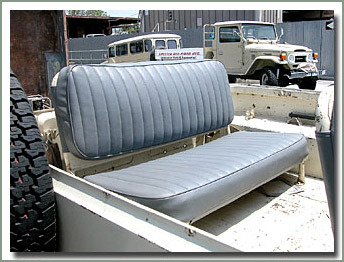 Fits 1958-1961 FJ25 front split bench seats- Made of Light Charcoal Grey Marine grade vinyl. 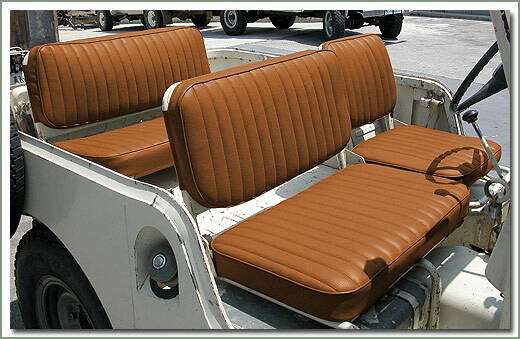 4 piece upholstery set includes drivers back and bottom cover and passenger bench back cover and bottom bench cover.